The Higher Education Policy Institute (www.hepi.ac.uk) is publishing a paper on the idea of having different tuition fees for different degrees. 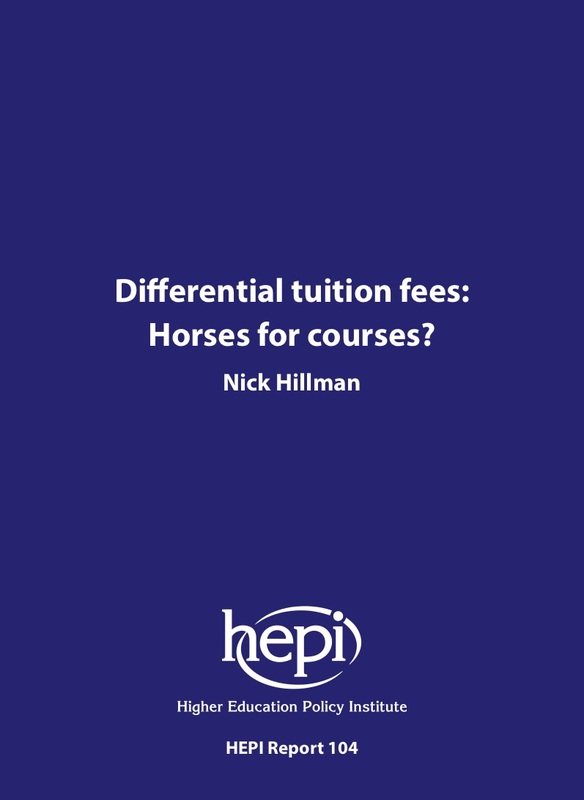 Differential tuition fees: Horses for courses? by Nick Hillman summarises the debate, includes the results of a survey among students about differential fees and argues that more differentiated fees are unlikely to deliver the benefits claimed by their many proponents. Different degrees are already meant to cost different amounts but, in England, fees have bunched up at the maximum price of £9,250 a year. Moving to a system of truly differential fees has many influential supporters. Some people seem to think having different fees for different degrees is inevitable. But the supporters of differential fees are deeply split on who should pay less and who should pay more, while most students reject the whole idea. At first glance, differential fees appear to have some advantages. It seems they could help poorer students, send signals about the value of different courses or help satisfy labour market needs. But, on closer inspection, these benefits prove to be largely illusory. Students are not price sensitive when choosing courses and differential fees are not even guaranteed to bring extra resources to universities. There are sound reasons why course fees have bunched at the level of the current fee cap. In opposing differential fees, students appear – yet again – to understand the logic of the current funding system better than many of its critics. Although undergraduate degrees are generally priced at the maximum £9,250 a year in England, the UK already has more price differentiation in higher education than is generally recognised. There is, for example, considerable fee differentiation between the four parts of the UK, for students travelling from one part of the UK to another to study, for international students, for postgraduate students, for students at alternative providers and for students on sub-degree courses. The survey was conducted using YouthSight’s Student Omnibus survey, which is the UK’s largest panel of young people, between 23 and 29 November 2017. The respondents were 1,019 full-time undergraduate students. Quotas were set on gender, university type and year of study and weights were applied to ensure a balanced sample. Respondents received a £1 Amazon gift voucher for answering these questions and others on another topic. This is not about the true value of a degree but its percieved value when compared to STEM.